You can add chapter membership after you become a PMI member, but your chapter membership will expire when your PMI membership expires. Additional FAQs are available at https://www.pmi.org/membership/faq - including automatic renewal options, accessing member benefits, and payment options. Thanks for reaching out! We are always looking for dedicated people to work with us in the PMI Baltimore Chapter. We have several open volunteer positions - everything from short-run opportunities to Director and VP positions. 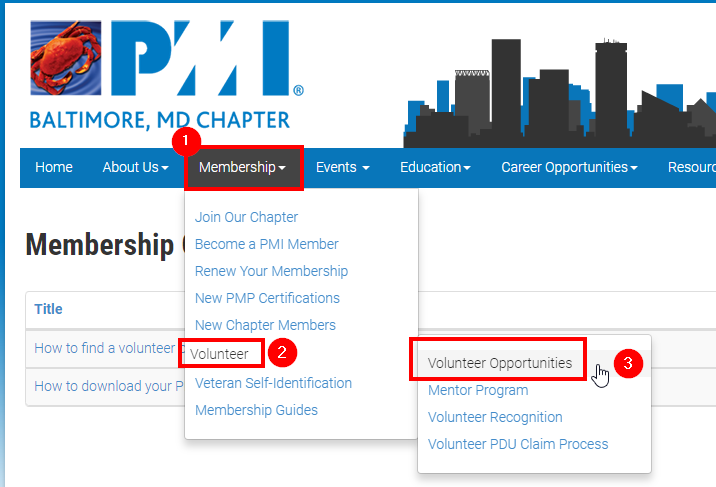 From https://pmibaltimore.org/ click the "Membership" menu, then "Volunteer", then "Volunteer Opportunities"
Once there - you'll need to log in to PMI.org using your PMI username/password - you will see the open positions. You can search by keyword, title, category. Reach out to me or the Director of Volunteers if you have any questions or if you're interested in a specific area but don't see any openings in that area. We are working on new positions each month and may have something coming up that is a good fit for you.